Originally published in 1983, fifteen well-known psychologists and psychotherapists write about their personal interests to give the reader a vivid picture of the complexities of psychotherapy in Britain at the time. They explore aspects of the interaction and intersection of the psychological and psychotherapeutic worlds, paying particular attention to the practical and theoretical controversies involved in this overlap. The first half of the book concerns itself with problems of theory and practice in psychology and psychotherapy, while the second half deals with professional conflicts and political issues impinging upon the practice of psychotherapy by psychologists. 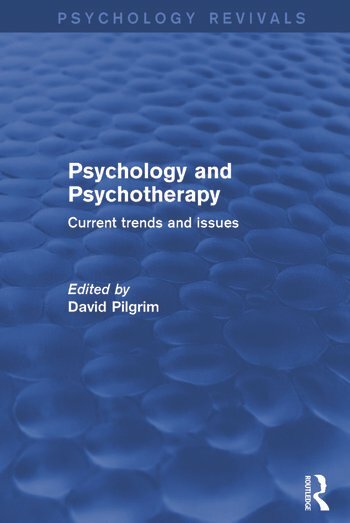 Areas of concern and controversy that are scrutinised include the problematic relationship between academic psychology and psychotherapy; doubts and certainties in psychotherapy; the psychology of helping; the relevance of the psychodynamic tradition; inter-professional disputes; women and psychotherapy; and social class issues in psychotherapy. David Pilgrim Editor’s Introduction Part 1: Theory and Practice 1. David Smail Psychotherapy and Psychology 2. Bill Barnes Doubts and Certainties in Practising Psychotherapy 3. Dorothy Rowe The Meaning and Intention of Helping 4. Peter Hildebrand The Contemporary Relevance of the Psychodynamic Tradition 5. Paul O’Reilly Personal Psychology and the Therapy of Families 6. Phillida Salmon A Personal Approach to Teaching Psychology 7. Andrew Treacher On the Utility or Otherwise of Psychotherapy Research Part 2: Politics 8. David Pilgrim Politics, Psychology and Psychiatry 9. Don Bannister The Internal Politics of Psychotherapy 10. Dan Gowler and Glenys Parry Career Stresses on Psychological Therapists 11. Sue Llewelyn and Kate Osborn Women as Clients and Therapists 12. Keith Nichols Psychological Therapy and Personal Crisis – The Care of Physically Ill People 13. Eric Bromley Social Class Issues in Psychotherapy. Index.